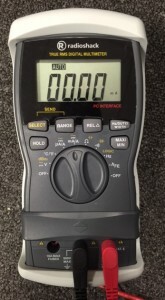 Nice new auto-ranging meter for under $35! My old trusty Radio Shack multimeter broke recently. I’ve had it for about 15 years and it has been a workhorse! I loved using it to build my stompboxes and debug my amps. The resistance function broke recently and it was time to find another. 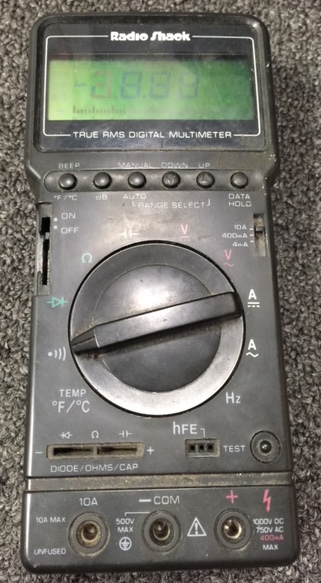 I have a number of meters but I wanted another one that was like my old Radio Shack meter. It had True RMS and other functions and it was accurate. Well, I searched on Ebay and locally and I found a newer model with auto-ranging and true RMS and even a computer interface. I just received the meter and it ROCKS! It seems much better made and almost everything from the display to the information shown to the probes and the extra fuses make this a great deal for under $35! I have a hard time imagining a better meter at this price. I think you will probably like it as well for building stompboxes! You can find it on eBay with this link. This entry was posted in Effects, Guitar Related. Bookmark the permalink. Comments are closed, but you can leave a trackback: Trackback URL.